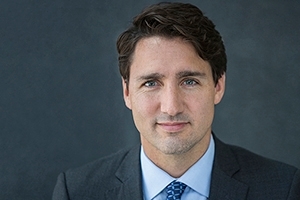 Canadian Prime Minister Justin Trudeau will speak at American University’s School of International Service at 10:30 a.m., Friday, March 11. Prime Minister Trudeau will give brief opening remarks and then engage in a question and answer session with students from the school. Mr. Trudeau’s talk at SIS coincides with his first official visit to the United States since taking office in November 2015. Mr. Trudeau jumped onto the international scene with his emotional welcome of Syrian refugees and an ambitious commitment to accept 25,000 refugees, which was achieved in February of this year. Mr. Trudeau has pursued his goal to change the tone and direction of Canadian foreign policy through an active role in multilateral diplomacy and global cooperation. To that end, he has personally participated in the United Nations Climate Change Conference, or COP21; the APEC Summit; the G20 meetings; and the World Economic Forum. Prime Minister Trudeau will be joined onstage by American University President Neil Kerwin, who will give opening remarks, and SIS Dean James Goldgeier, who will moderate the question and answer session with students.